Now in its 14th year, the Integrated Policy Exercise (IPE) has become a signature component of the Ford School master's program. For three days during the first week of January, MPP and MPA students play stakeholders in in a large-scale and continually evolving simulation of a real policy issue. The exercise allows students to experience first-hand the complexity of policymaking, hone analytic and negotiating skills, and interact with policy experts. This year's IPE, developed and taught by Professor Elisabeth Gerber, had students grappling with the policy and politics surrounding Great Lakes water resources. In 2008, the Great Lakes-St. Lawrence River Basin Water Resources Compact was adopted to provide a framework for the states and provinces within the Great Lakes Basin to manage these resources. The Compact details procedures for considering (among other matters) requests by applicants to divert water out of the Basin. In roles ranging from elected officials, to business and environmental stakeholders, to the media, students considered a current application from the City of Waukesha, Wisconsin, to the Compact Council to divert Lake Michigan water as a municipal water supply. The simulation engaged the bi-national, national, state/provincial, regional, and local decision-making processes involved in applying the processes described in the Great Lakes Compact to the Waukesha water diversion application. IPE gives students the opportunity to consider policy issues outside their traditional areas of interest. Many students who came in knowing little about the Great Lakes Compact or water diversion were immersed in the policy complexities of the basin. Describing his experience, Rey Goicochea (MPP '14) explained "Initially I did not want a large role in IPE, however, after meeting with my stakeholder from the Waukesha Water Utility and seeing his earnest and well researched defense of his community's request for water, I began to believe in his position and embraced my large and important role in the simulation. I ended up learning a lot more about groundwater, aquifers, rivers, and the importance that Great Lakes water issues have for Mid-West residents, something that being from Oregon I had never thought of." After hearing from real experts in their assigned stakeholder or decision-maker roles on day one, students began formulating their positions and strategies, including building coalitions. The Great Lakes Commissions of all eight Compact states then held individual hearings to formulate recommendations on the application. Throughout the process, state and local politicians, including the Great Lakes governors, negotiated with each other in pursuit of a decision that best represented both the interests of their states and the collective spirit of the Compact. Students portraying the media kept tabs of all the action, both public and behind the scenes, throughout the simulation. Members of the media reported their findings both in articles on the IPE website and through a range of social media outlets. Twitter became a driving force in the action, as students embraced the platform's ability to instantly disseminate breaking news. Throughout the three-day simulation, students also had the opportunity to hear from keynote speakers with significant experience in issues of Great Lakes policy, including Bill Rustem, Director for Strategy for Governor Rick Snyder, Canadian Counsel General Ray Norton, and Lana Pollock, Chair of the International Joint Commission. 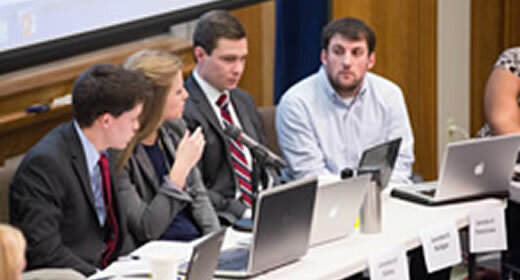 This year's IPE successfully pushed students to think about the many issues, interests, perspectives, and decision-making steps involved in applying the Compact's procedures to the Waukesha case. Chris Falcone (MPP '14), who played Governor Scott Walker, stated, "This type of exercise is why I came to the Ford School. It allows us to become immersed in a real-world situation and play out the many facets of the policy-making process – from analysis, stakeholder input, negotiations, and ultimately, a policy decision. That experience is immensely valuable and will better prepare us for our careers."